Department of Physics, The M.D.T. Hindu College, Tirunelveli-627010, Tamilnadu, India. Department of Physics, S.T. Hindu College, Nagercoil-629002, Tamilnadu, India. out to confirm the crystal structure. 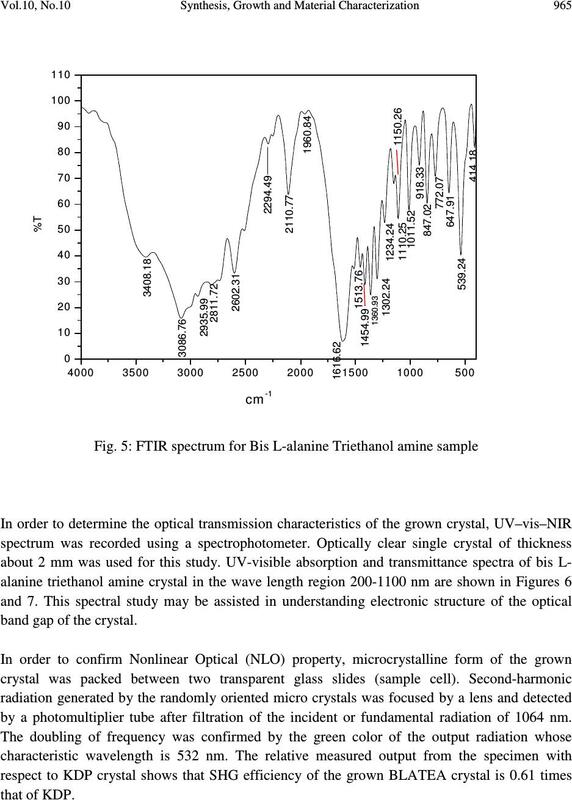 FTIR study reveals the functional groups of the sample. C. It is used in dry cleaning soaps, cosmetics, textile processing and as corrosion inhibitor. various studies such as structural, optical, mechanical and dielectric studies. and it is displayed in the photograph (Fig.2). 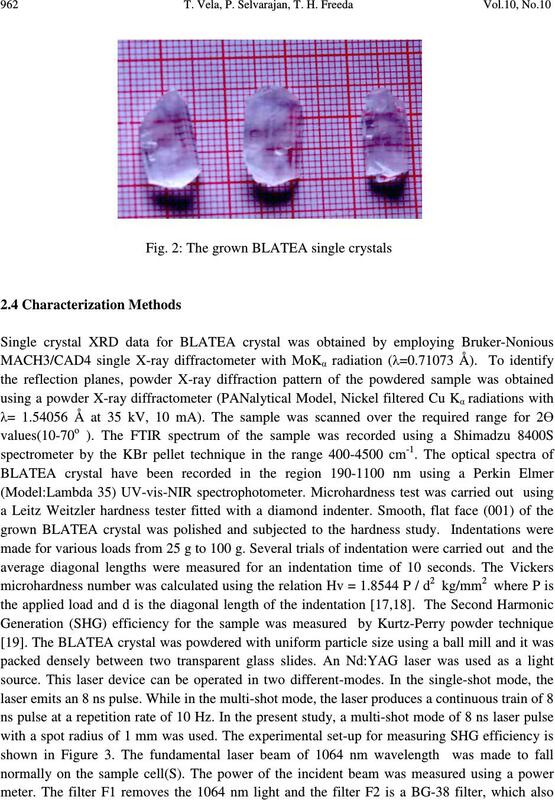 as BLATEA crystal and it was used as reference material in the SHG measurement. 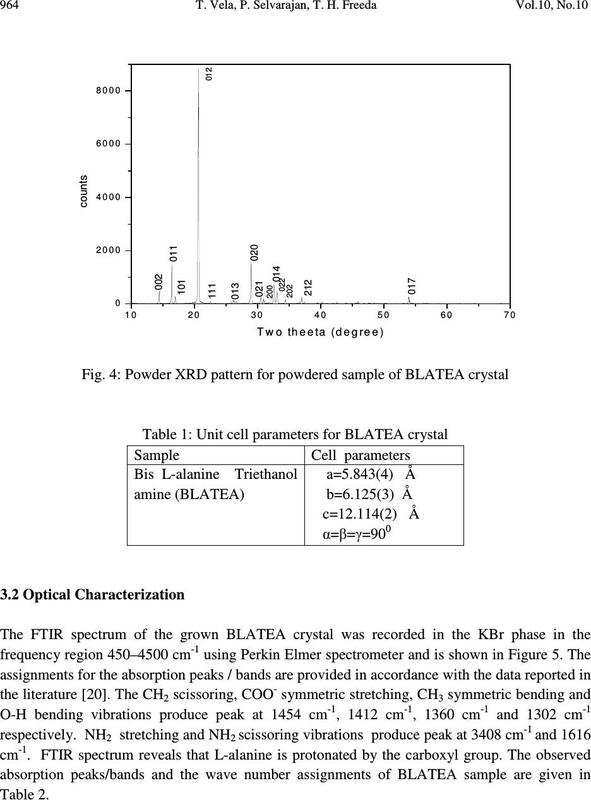 BLATEA crystal crystallizes in orthorhombic structure. 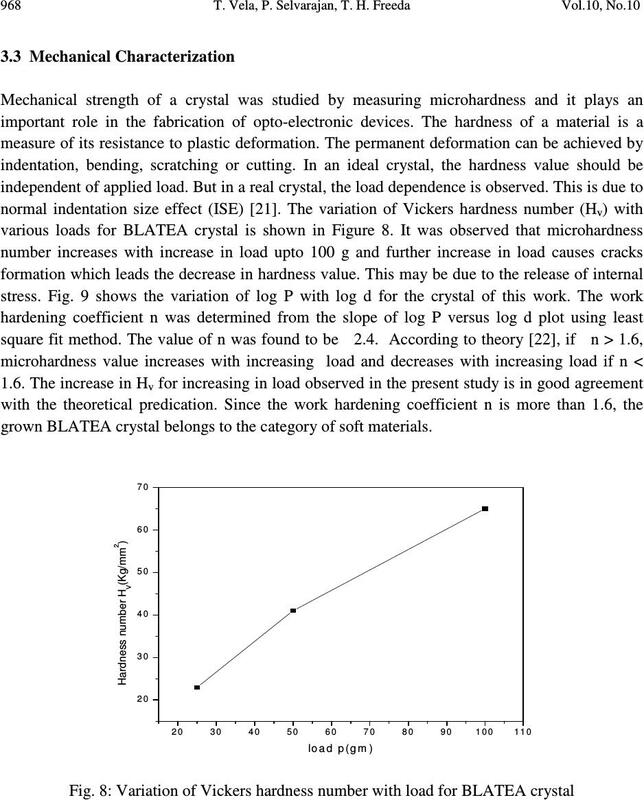 band gap of the crystal. by a photomultiplier tube after filtration of the incident or fundamental radiation of 1064 nm. 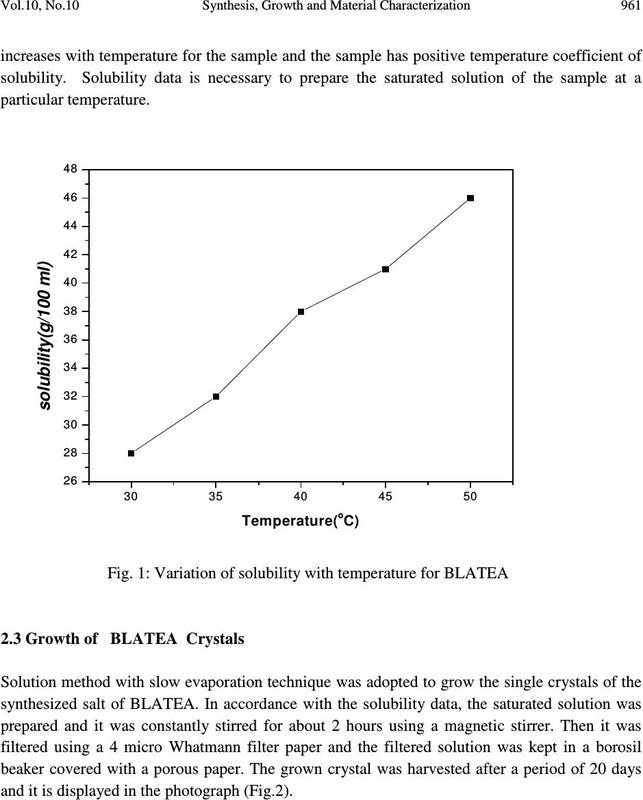 grown BLATEA crystal belongs to the category of soft materials. 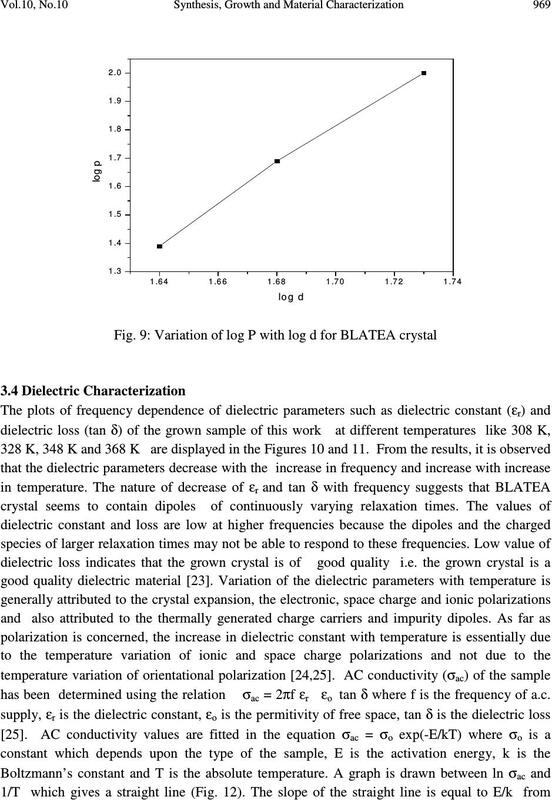 tan δ where f is the frequency of a.c.
value of activation energy indicates that the sample is an insulating type material. 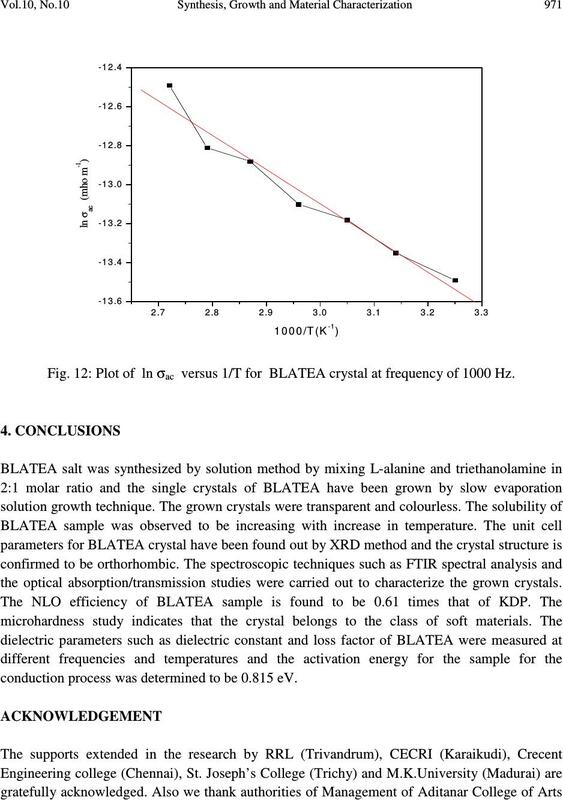 versus 1/T for BLATEA crystal at frequency of 1000 Hz. 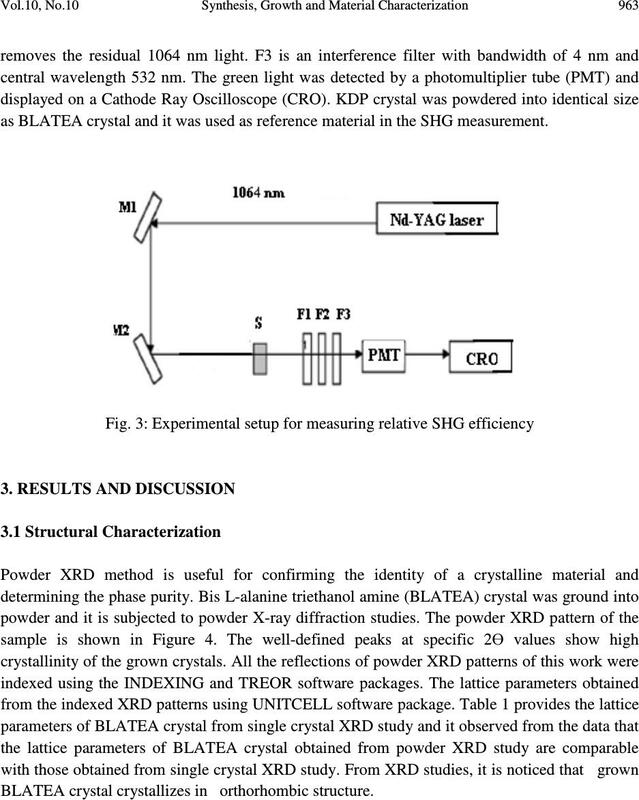 the optical absorption/transmission studies were carried out to characterize the grown crystals. 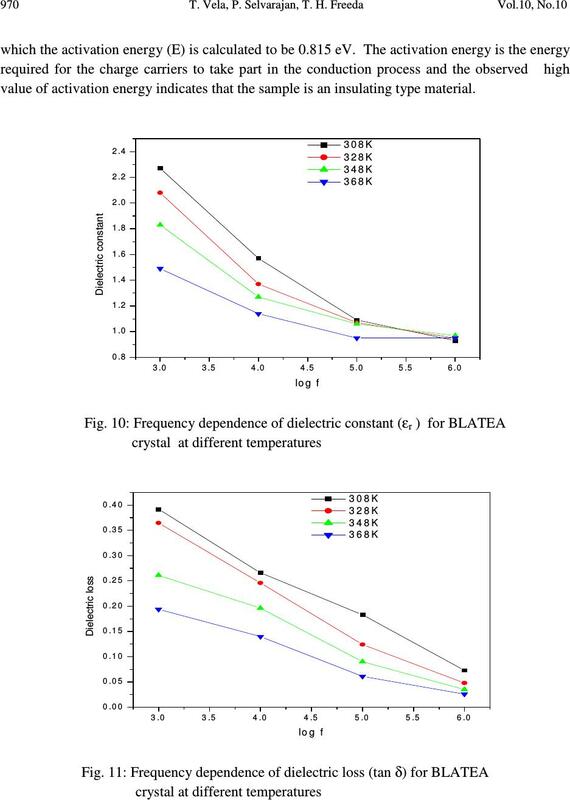 conduction process was determined to be 0.815 eV. for the encouragement given to us to carry out the research work. 1. J.A.Zerkowski, J.C. Mac Donald, G.M. Whitesides, Chem. Materials 9 (1997)1933. Crystals, Vol 1, Academic Press, Florida, USA, 1986,. 3. S. Manivannan, S. Dhanuskodi, J. 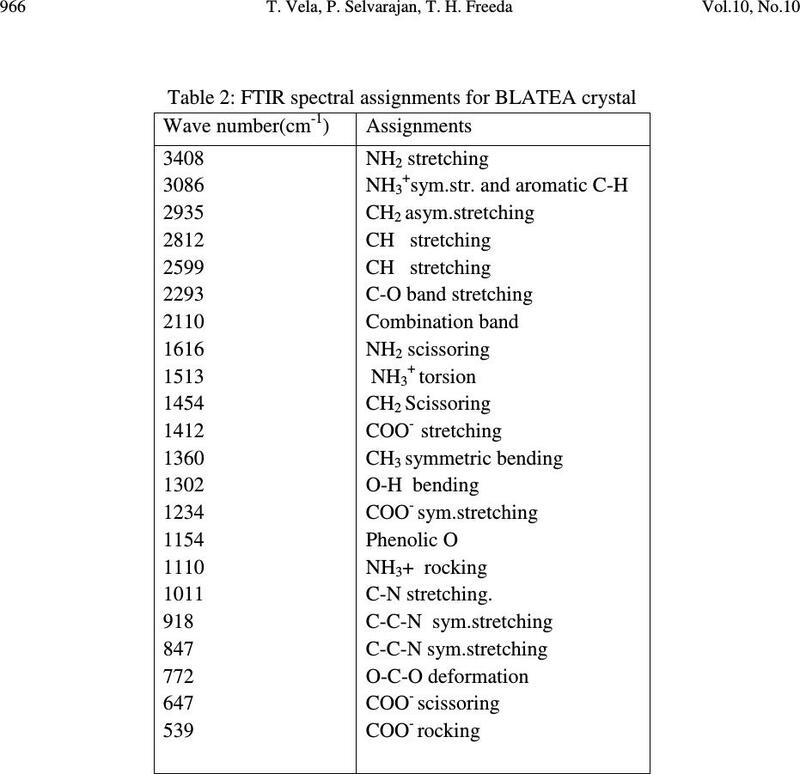 Crystal Growth 262 (2004) 473. 4. J. Badan, R. Hierele, A. Perigand, J. Zyss, Am. Chem. Soc. Symp. Ser. 233 in D.J. Williams (Ed. ), Am. Chem. Soc.Washington, Dec 1993. 6. J.D. Bernal, Z. Kristallogr 78 (1931) 363. 7. H.J. Simpson Jr., R.E. Marsh, Acta Cryst. 8 (1966) 550. 8. R. Destro, R.E. Marsh, R. Bianchi, J.Phys.Chem. 92 (1988) 966. 9. V. Bisder-Leib, M.F. Doherty, Cryst. Growth Des. 3 (2003) 221. 10. Thenneti Raghavalu, G. Ramesh Kumar, S. Gokul Raj, V.Mathivanan, R.Mohan, J. Crystal Growth 307 (2007) 112. 11. M. Diem, P.L. Polavarapu, M. Oboodi, L.A. Nafie, J. Am. Chem.Soc. 104(1982) 3329. 12. 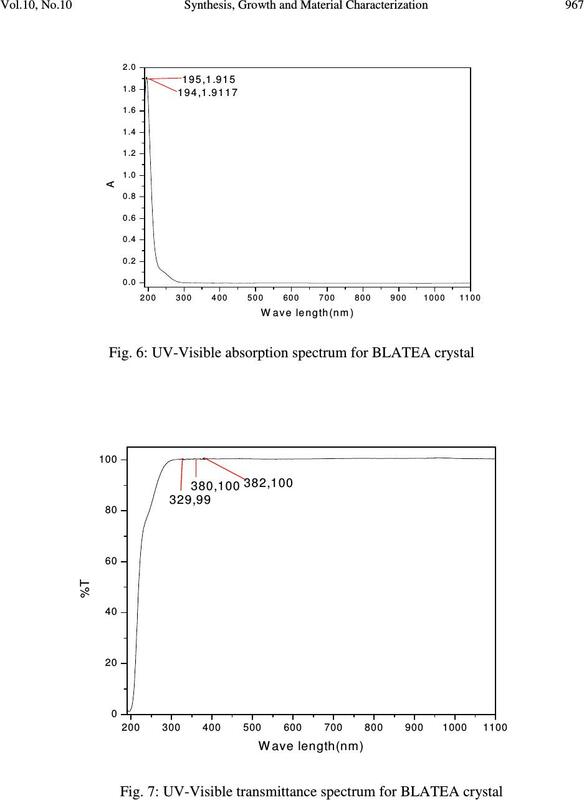 D. Godzisz, M.H.czysym, M.M.Jesyszym, Spectrochim Acta Part A 59(1)(2003) 681. 14. 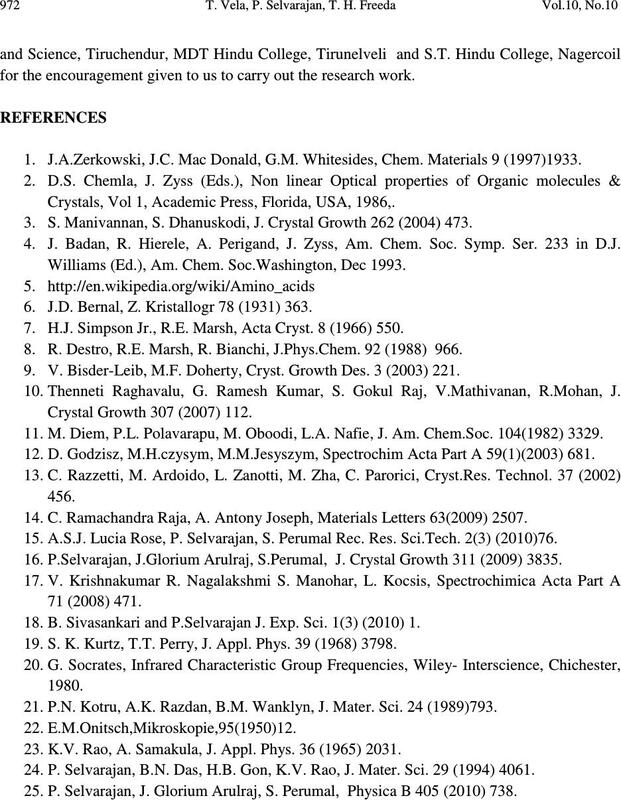 C. Ramachandra Raja, A. Antony Joseph, Materials Letters 63(2009) 2507. 15. A.S.J. Lucia Rose, P. Selvarajan, S. Perumal Rec. Res. Sci.Tech. 2(3) (2010)76. 16. P.Selvarajan, J.Glorium Arulraj, S.Perumal, J. 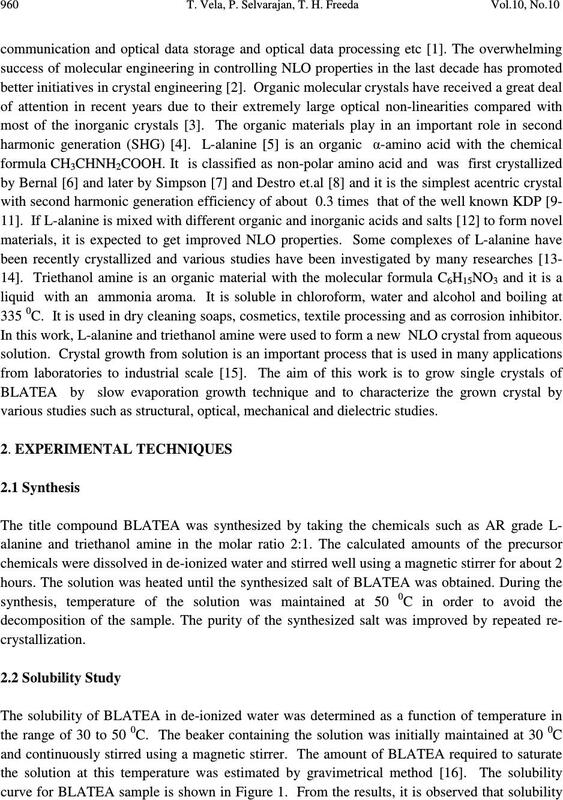 Crystal Growth 311 (2009) 3835. 18. B. Sivasankari and P.Selvarajan J. Exp. Sci. 1(3) (2010) 1. 19. S. K. Kurtz, T.T. Perry, J. Appl. Phys. 39 (1968) 3798. 21. P.N. Kotru, A.K. Razdan, B.M. Wanklyn, J. Mater. Sci. 24 (1989)793. 23. K.V. Rao, A. Samakula, J. Appl. Phys. 36 (1965) 2031. 24. P. Selvarajan, B.N. Das, H.B. Gon, K.V. Rao, J. Mater. Sci. 29 (1994) 4061. 25. 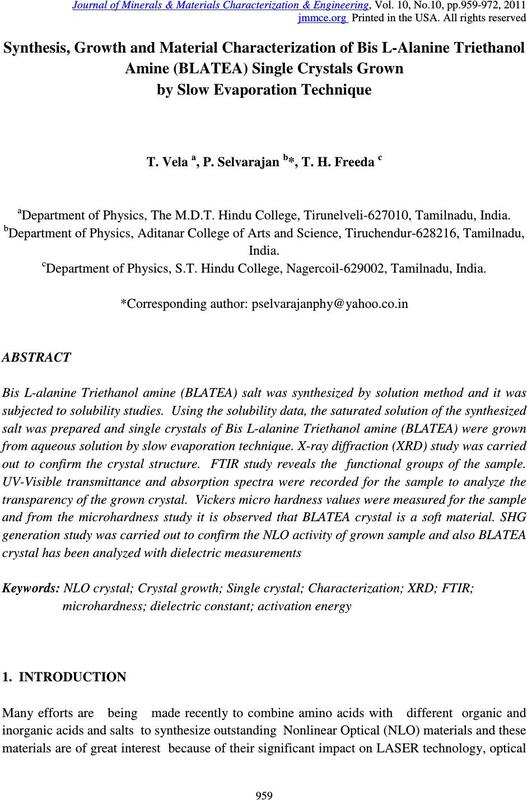 P. Selvarajan, J. Glorium Arulraj, S. Perumal, Physica B 405 (2010) 738.